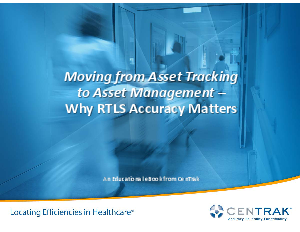 This eBook will explore the distinction between asset tracking and asset management -- and how RTLS accuracy can help hospitals achieve greater value and return on investment. Also included is a real-world case study from Mike Kohler, Director of Materiel Management at Mission Hospital Regional Medical Center in Orange County, CA. Mr. Kohler successfully installed a certainty-based RTLS system to enable Asset Management use cases.